In the 1970s, New Jersey-based Remco released a line of “tru-smoke” toys. 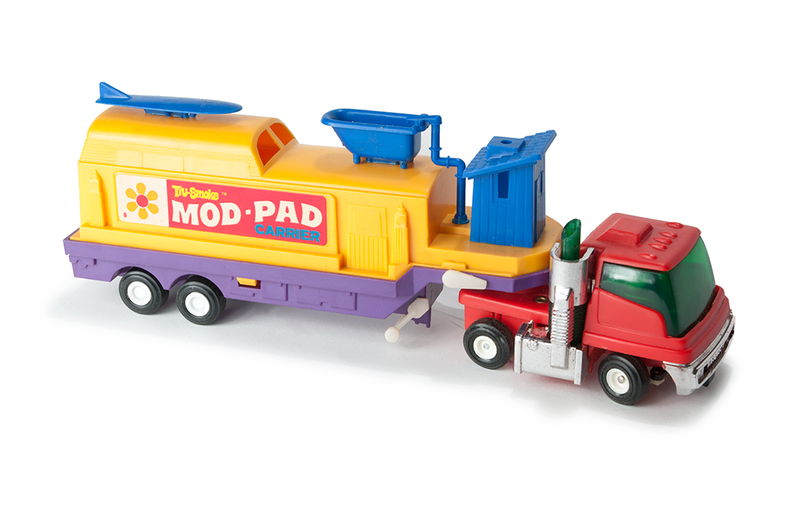 One of these miniaturized vehicles was the Mini Diesel Mod-Pad Carrier. Released in 1970, it emitted “clean, harmless smoke” while it operated. The truck measures 10-inch long, runs on two “D” batteries and sports fun detachable accessories. The smoking process is initiated by placing a drop of Remco Tru-Smoke Oil (a.k.a. mineral oil) into the truck’s exhaust stack. After fueling up and connecting the trailer body to the cab, kids just flipped a switch and the truck would both move forward and start smoking. The mini-diesel also included a steering tab that allowed the front wheels to be set to “straight”, “right”, or “left” position. In addition to the Mod-Pad Carrier, Remco released three other mini tru-smoke trucks, including the Giant Crane, Dune Buggy Carrier, and Air-Sea Rescue. Released in 1974 by Marx, Frenzy has all the attributes worthy of its name. Patience, a steady hand, and fast reflexes are paramount to success.